On December 11, 2016, I presented Confluence: A Natural History of Sacramento as part of the Sacramento Public Library’s series 95H20. That presentation shared glimpses of many maps to explore why our city sits in a flood basin instead of on the relatively high banks of the American River. Although these riverbanks were the best place to settle, they are now mainly recreational assets and underdeveloped industrial wasteland (with patchy residential redevelopment). Some of the maps used in this presentation are held by the California State Library and the Center for Sacramento History; members of the public are welcome to view them on site but Confluence does not have permission to reproduce them. Fortunately, many maps from the presentation are available online in some fashion, and to provide you with an easy way to view some key depictions of early Sacramento, I’ve assembled an annotated gallery through hyperlinks. Many of these images are extremely high-resolution and will allow you to view even the smallest features and labels. I’ve gained some important insight from these images, and trust that others will notice many new details that I missed. Please comment below if you catch anything particularly interesting. These maps show the larger context of the Sacramento area, illustrating that we live in a strange land where the rivers flow higher than the surrounding earth! The 1849 Riley survey map is one of the earliest overviews of the region, and provides a sense of the wetlands of Sacramento. It shows a bit of the area’s early transportation network, including primitive versions of the routes now served by US-50 and CA-99. Note the absence of anything resembling I-5 or I-80, except for the “Benecia Road impassible during rainy season” (which is supplemented by a much longer “Road round the Tule”). This topographic map by Jesus Alvarez indicates two areas where riverbanks are the high ground. The Sacramento River near Colusa is the meandering light green (higher) wedge just south of the Sutter Buttes, with darker green (lower) flood basins on both sides. The American River’s raised banks are faintly visible just east of the letter “V” in “valley.” The same flood basins and elevated river channels are also visible on this 1887 map of topography and irrigation, which was not included in the presentation but provides a fascinating high-resolution overview of the valley’s topography and late-19th century agriculture. The Vioget map of Nueva Helvetia illustrates how land along the rivers was all that was seen as worthy of claiming or mapping. Everything else was just “tule” – thickets of aquatic rushes. There are many versions of this intensely political map of Johann Augustus Sutter’s claim, including one posted at the Sacramento History Museum. Some of these versions include the false lines of latitude that incorrectly indicate that Sutter’s grant extended to the Sacramento area, which eventually made it into the 1864 U.S. Supreme Court ruling that finally validated Sutter’s claim (sort of). The California State Library has a collection of versions of the Vioget depiction and related maps. This collection also includes the 1859 Doherty swampland survey of Sacramento, which was featured in the presentation but is apparently not available online. I have developed an interactive map of “Older Sac”, which perched on bluffs along the former course of the American River, with two pre-grid settlements overlaid on what is presently found there. My presentation repeatedly deployed images generated from a GIS (geographic information system) depicting a “bare earth LIDAR” survey – an airborne laser calibrated to strip away surface structures and detect the elevation of the underlying soil. This data is not presently viewable in an interactive form, but hopefully that will change soon, as I believe this data can provide profound insights when various historic maps are overlaid. Meanwhile, here are two images from the GIS, including an overlay of the original Sacramento City plan, which is thus revealed as a scheme to sell swampland to unsuspecting immigrants. This LIDAR image shows artificial forms including the dump and levees as well as the elevated streets of downtown. It also shows the prehistoric channel of the American River, and more recent sloughs, winding through what is now East Sac. The original city plan is overlaid on the LIDAR image, illustrating how most of the Grid was lower elevation (green) while the now-neglected American River banks are somewhat higher (yellow). Note differences between the channels of the Gold Rush and modern American River courses. The original 1850 city plan overlaid above is strangely difficult to find online, although this website does provide a low-res version. 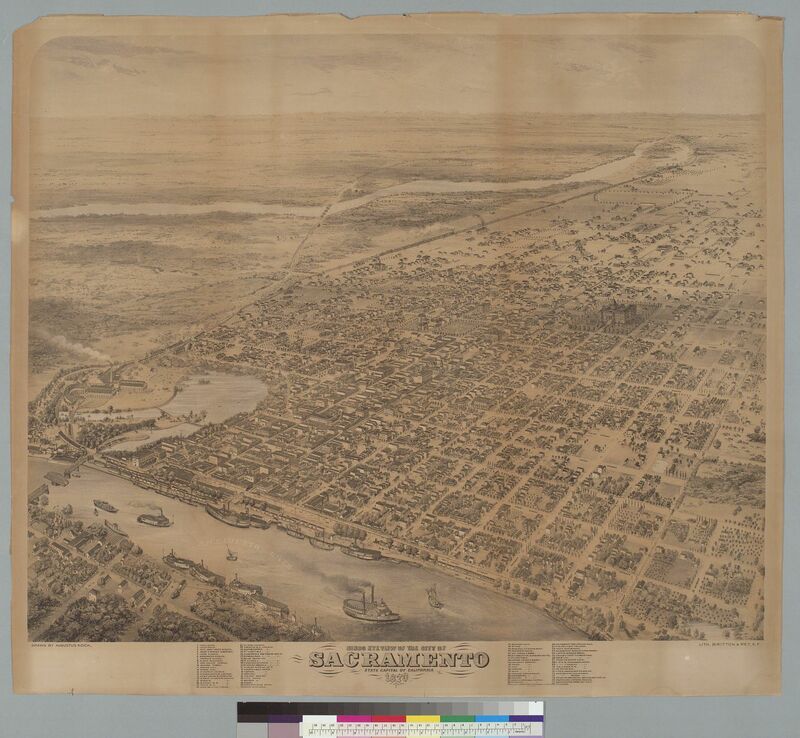 The 1854 city map, which shows both Older Sac and the old confluence, does not seem to be available online. However, it appears in a recent video featuring the Center for Sacramento History’s Marcia Eymann. I have some differences of interpretation with Eymann, including her description of the whole area as “marshy swampland” – in fact the Sacramento City grid was in the swamp, while the railroad’s development isolated and eventually destroyed the old settlement site on the elevated confluence riverbanks. Even so, the video has some great photographs and is worth watching. A map of Sacramento’s underlying geology, including the ancient East Sac river course, can be found in the Cultural Resources chapter of this Railyards Project environmental impact report (following p. 4.4-7) This section of the report provides some useful context but seems to underestimate the archaeological potential of the former settlement site where the American River once joined the Sacramento. 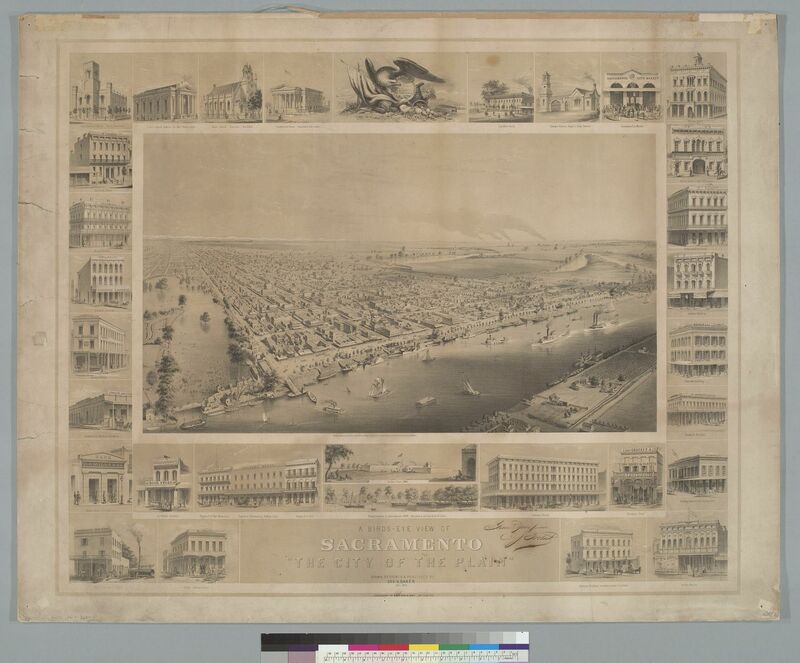 The George H. Baker birdseye of 1857 Sacramento shows China Slough along I Street, as well as the southern wetlands that were eventually converted into neighborhoods. R Street was the city’s real southern boundary at this point, and the most prominent landmarks visible beyond the tracks of the original railroad are sloughs including what eventually became the pond in Southside Park. The Augustus Koch birdseye depicts Sacramento in 1870, with the Railyards depicted just north (left) of China Slough. While most other land north of the B St. tracks and levee is shown as empty (which I do not believe was accurate), a small residential area is clearly visible in the lower left corner of the image. A map titled “Rutte, Muldrow and Smith” by G.H. Goddard (1857) shows some of the sloughs that drained through northern East Sacramento and the McKinley Park pond. It features “Muldrow’s Gardens” which now comprises the former city landfill and the new McKinley Village development. Many sought to cash in on the Gold Rush by “mining the miners” through the creation of “paper towns” in which land was surveyed and sold despite being unsuitable for habitation. The grid of Sacramento City was not the only large-scale attempt to commodify marginal land, but it was the only one to survive east of the Sacramento River. The original Sutterville plan called for a city that was at one point envisioned as nearly 2/3 the size of Sacramento City; surviving maps are unfortunately unavailable online. The original 1847 plan is even harder to find, as I have not yet located a copy anywhere in Sacramento. Ironically, the best depiction of the area’s first attempt at city building appears the official 1911 map of the county, which depicted the old Sutterville grid as it disappeared beneath early development of what we now know as Land Park (see below for more on this map). Unlike out-of-the-way Sutterville, a paper town called Boston was close to Sacramento City, and managed to squeeze onto several maps. One such map, reportedly from 1848, is still something of a mystery. I’ve been provided with an image that is also included as one of three fragments at this website. If anyone knows the original source, please let me know. In any case, the navigational chart showing the route to “Sacramento and Boston” clearly depicts another city between downtown and the Garden Highway. This chart was that day’s equivalent of the Rand McNally road atlas (or perhaps Google Maps), and it turns out that its creator, Cadwalader Ringgold was also the surveyor of the Boston scheme, which he presented as an equal to Sacramento City. This document is an important case study of the conflict of interest that appears in many early maps of Sacramento, which often served to promote or undermine the various conflicting land claims. The 1873 Gray’s Atlas map shows a number of old American River watercourses, including the old channel and confluence. It depicts the Boston site as ponds, channels and brush, as though to emphasize that this place is uninhabited and uninhabitable (in contrast to the blank areas that surround the rest of the city. Similar treatment is given to the Boston site in the 1854 map referenced above. However, this official 1911 map of the county shows a large parcel just north of the Old Channel on the east bank of the Sacramento, marked “A.M. Mull,” which may have been a remnant of Boston – it is perhaps equivalent to 12 of that town’s blocks, which were described in Edward Gould Buffum’s Six Months in the Gold Mines (1850). This fascinating map also depicts the old layout of Sutterville, as well as the site of Calle de los Americanos on the American River near 16th St., despite those both apparently being superseded by later development. The confluence settlement that I call “Older Sac” is conspicuously and strangely blank, despite that area surviving to at least 1895, when a remnant appears on the Sanborn maps (available here to Sacramento Library patrons). I have begun to reconstruct the old Boston city grid, using clues from Buffum and elsewhere, and I’ve discovered that there are numerous remnants of the city depicted in Ringggold’s chart, ranging from an intersection at the edge of the Railyards project to the path of the bike trail between Discovery Park and a large gravel quarry. This list is based on a relatively cursory series of search engine inputs, and I assume (and hope) that I’ve missed something. If you are aware of any other maps that I’ve missed, online or otherwise, please send an email to tours (at) sactoconfluence (dot) com. I’ll especially welcome corrections regarding availability of maps that I used in the presentation but was unable to find. Thank you! I hope this collection provides a good complement to the library talk. Although incomplete, the maps that are available online provide an easy way to look more deeply at what flashed by during that whirlwind tour of the Confluence. Enjoy!